Our dedicated team is constantly making tireless efforts to shape the clients’ adventures not only fun but also a meaningful experience. How do we do it! By empowering our programs to be sustainable with a focus on responsible tourism. All of our programs are well crafted and designed to create authentic experiences and balances among nature, wild life animals, locals, guides & porters, and the government. We empower our clients with the feeling of not only a wonderful trip, but also a responsible way of traveling that makes their trip more fun and more meaningful. Our idea is to blend the spirituality with adventure. We believe that adventure is one of the many ways to know ourselves better. We learn about ourselves more when we are breaking our limits and by seeking adventure of all kinds we get closer to ourselves. Had an amazing time in Nepal thanks to Ajay and Temba from SWOTAH TRAVEL that went above and beyond to make my Nepal experience unforgettable! Thank you for your kind words, Jennifer. It was privilege knowing you as a person. We learned awful from your experience and it was fun arranging the logistics for you. Hope to see another time in Nepal. WIshes!!! Swotah Travel and Adventure vs Nepal Hiking Pvt. 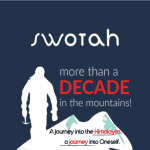 Ltd.
Swotah Travel and Adventure vs Manakamana Treks & Expedition Pvt. Ltd.
Swotah Travel and Adventure vs Himalayan Glacier Trekking Pvt. Ltd.